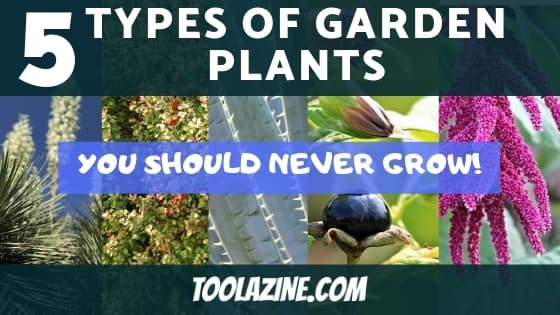 Toolazine 5 Types of Garden Plants You Should Never Grow! 5 Types of Garden Plants You Should Never Grow! Gardeners choose carefully which plants they want to grow on their lawns. Whether you want hedges to line your house, flowers for a flower box, or vegetables to eat, it’s important to make informed decisions. However, some people choose to grow the wrong plants because they simply don’t understand the dangers. In many situations, the dangers are conditional; a plant might be hazardous to dogs but not to humans, for example. In that case, anyone with a pet or with neighbors’ pets who come through their yards shouldn’t grow that plant. In other situations, a plant might be beautiful but it might be the kind of plant that can take over your entire garden. Here are five types of garden plants you should never grow and one that requires special care. Aloe vera is known mostly for being the active ingredient in many kinds of lotions and sunburn ointments. Aloe vera is a succulent, which means that it’s similar to a cactus. The plant produces an oil that can soothe burned skin; however, it also produces a natural form of latex just under the skin. That latex is a lot like the latex used in rubber gloves. So, you can imagine what might happen to a pet who eats that plant. If a dog or cat eats aloe vera, the plant can cause extreme gastrointestinal distress. It can lead to cramping and very unfortunate bowel problems. For these reasons, aloe vera should only be grown out of reach of pets. If done carefully, aloe vera can be a beautiful plant that soothes burned skin. Just don’t let your dog get it. Never grow Aloe Vera. Help spread the word. Please share this on Pinterest! Atropa belladonna might not ring any bells. However, you probably recognize its common name: deadly nightshade. As a nightshade, it’s actually in the same family as tomatoes and potatoes. It has broad green leaves, beautiful purple flowers, and rich black berries. However, it is a very poisonous plant. The effects of atropa poisoning are actually fairly unpredictable. Typically, the poison causes sweating, breathing problems, cardiovascular problems, paralysis, and death. If you have children who might ingest it, pets, or you live in a crowded neighborhood, you should never grow deadly nightshade. Don’t let the beautiful flowers fool you; it’s a real danger. Never grow Atropa Belladonna. Help share the word. Please share this on Pinterest! Japanese barberry trees is very popular amongst landscapers. The leaves are a rich purple, and the buds are golden yellow. It is a beautiful addition to any lawn. Also, Japanese barberry is drought-tolerant, shade-tolerant, and resistant to deer. These all make it an obvious choice for a landscaper who wants something that their clients will enjoy but requires little upkeep. However, Japanese barberry trees are also home to the black-legged tick. This is the tick that most commonly carries lyme disease. Furthermore, the buds produce seeds that blow on the wind and quickly spread. Within a year or two of flowering, you and your neighbors will have Japanese barberry popping up everywhere. They grow in thickets with sharp thorns. Your neighbors likely won’t appreciate you invading their yards with thorny thickets and diseased ticks. Opt for a native species of barberry instead. Never grow Japanese Barberry. Help share the word. Please share this on Pinterest. If you want to win a home beautification contest, amaranthus is a solid addition. Native to North America, the amaranth family is a broad group of plants that produce vibrant purple flowers. They are short-lived perennial plants that require a decent amount of upkeep. Their beautiful flowers and the stunning designs in which they grow make them a show-stopper. However, amaranthus plants are also huge producers of pollen. That means that they will aggravate any allergies you might have. If you don’t want your car covered in pollen every spring, skip the amaranth family. Never grow Amaranthus. Help spead the word. Please share this on Pinterest! Yucca is the name for a species of different succulents native to North America, South America, and the Caribbean. The plant is identifiable by its large sword-shaped leaves; these are actually pretty shape, so be careful. The plants produce stalks of white flowers that rise high above the foliage of the plants. Yucca is beautiful and often grown as an ornamental; also, being drought-resistant reduces the amount of necessary upkeep. However, they only bloom for about a week each year. They also attract incredible amounts of bugs. Furthermore, the roots tend to grow very deep and very wide. If you eventually get tired of the bugs swarming around your yucca plant, you will have to do some serious digging to completely remove the plants. Be careful as you remove it; it’s covered in leafy swords. You’re better off if you just choose a different succulent. Agave, for example, looks similar and has more uses than yucca. Never grow Yucca. Help spread the word. Please share this on Pinterest! So, you shouldn’t grow any of the previous five plants in your garden. Mint is often included as a plant that you should not grow in your garden but there are some conditions. The various species of mint are known for their flavor and their fragrance. They’re used for jellies, teas, cocktails, and various recipes. Many of them, especially spearmint, are also very easy to grow. As they grow, they send out runners which are stems that run along the ground. Whenever the stems become moist, they begin producing roots. That means that mint can spread along your garden and eventually take over an entire lawn. Once the mint spreads, it can be almost impossible to root out. Even if you uproot the original plant, everywhere that it has put down roots will be a viable plant. In fact, cutting it up can actually cause it to spread faster by separating them. However, you can grow mint in your garden. You just need to make sure you keep the mint if a flower box or planter that is above the surface of the ground. The sides of the planter need to raised above the level of the soil in the planter too. Keep an eye on the runners from the mind to make sure they don’t spread to the soil outside of the planter. These five plants plus mint can be dangerous to your pets, your children, or to the health of your lawn. If you decide you want to grow any of them, keep these dangers in mind. Help spread the word. Please share this on Pinterest!